Best Cheap Park City Utah Hotels - Sleep & Ski on a Budget! You are here: Home / Best Cheap Park City Hotels – Sleep & Ski on a Budget! For those of you who are more on a budget, there are some cheaper lodging options in Park City. “Cheap” is relative in Park City. Being a world-class ski-resort town, you are not going to find a Motel 6 here at $45/night. But there are some really nice budget hotels for those who do not need, want or can’t pay for all the extras at resort-hotel prices. Below you will find the top-rated Park City hotels that will let you sleep in comfort without breaking the bank. The best thing about the Chateau Après Lodge is its price and location. While you can spend over $400/night at the Park City Mtn. Resort, just a 3-minute walk away is the Chateau where you can spend as little as $40/night! The Chateau, a family owned and operated lodge, offers regular hotel rooms with private baths that start at $125/night for 1-2 persons. But if you want to go super-frugal, stay in a dorm room for only $40/person plus tax which includes a continental breakfast! 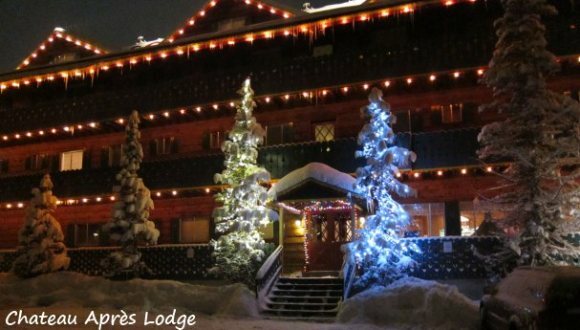 The rooms have two rows of bunk beds with a cozy bed to lay your head down – all you need after playing on the slopes during the day and an evening on the town. The only bummer is that the dorm rooms are available to women only from Jan 15-Jan 27. Men get the bunks the rest of the season. The prices for the hotel or dorm room are awesome deals if you don’t care about extras. This is definitely a no-frills, just-the-basics hotel, but it is comfortable and clean. If your focus is skiing, then the Chateau is your best bet. There’s a nice common area with fireplace and they even provide complimentary hot cider after a cold day on the slopes. Chateau Tip: If you want to save walking up and down a flight of stairs when going to slopes with skis and boots in tow, ask for a room on the second floor. The back door exit is on this level which leads to the mountain base. Note that you can also store your equipment at a locker at the Resort. Park City Mtn told me they have a ski valet where you can store your ski/poles or snowboard overnight. The cost last year was about $7 per night. But I feel the 3-minute walk isn’t so bad, even carrying equipment, and would personally save the $7. Other than the Chateau, most of the lower-priced hotels are located at the Park City exit off I-80 which is approximately 3 miles from Canyons, 6 miles from PCMR and 8 miles from Deer Valley. If you choose lodging here, bus stops are just outside to take you to any of the three resorts for free. Even though you are not downtown, there are still lots of restaurants, shops (including Tanger Outlet Shops), a movie theater, a modern bowling alley/lounge/arcade and more at Kimball Junction so you’re not in the middle of nowhere. Although not in Park City, the Lodge at Stillwater is right across the highway from the Deer Valley Gondola, making for easy Resort access without having to pay resort-lodging prices. The Lodge is located on Jordanelle Reservoir with beautiful views of the lake and mountains. It’s a very nice lodge offering studio, hotel rooms and bedroom suites. There’s a heated swimming pool, 3 Jacuzzis, fitness center, game room and Bar & Grill. If you don’t mind the isolation from Park City, then this is a great option for cheaper lodging. especially if you want to do most of your skiing at Deer Valley. So now you can stay at a Park City, Utah hotel and have some extra money to spend on what’s important – skiing and/or riding the slopes!